Swell, generated by distant storms, and wind waves, generated locally, interact in a variety of ways. I’ll describe a couple of those below. 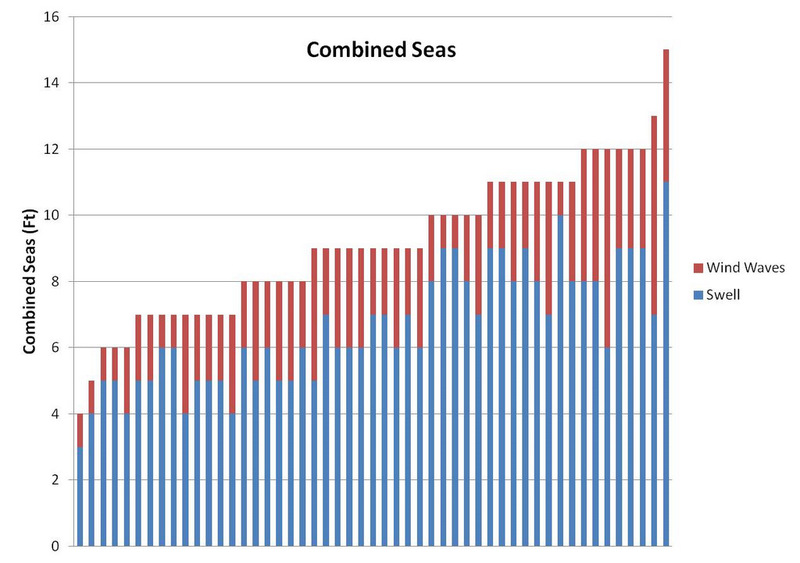 People sometimes use the term combined seas when they don’t differentiate between swell and wind waves. My experience is that wind waves can combine with swell to increase the overall height of waves reaching the beach. On the other hand, sometimes wind waves arrive on the outer shores with a different timing or cadence than swell. When this happens they may or may not combine but there is an apparent effect on period, which can get somewhat obscured. In the graph above, I plot the combined size, in feet, of swell and wind waves for the last 50 or so times I’ve been out on the beach. This plot is not meant to imply that swell and wind waves always combine in this way (I’ve already described this above), but it does seem to me that frequently there is a more or less additive effect. It is apparent that under the somewhat calm conditions during which these observations were made, swell makes a bigger contribution to the size of waves hitting the beach than wind waves.